Due to a change in domain registrar my site jkp-ads.com is temporarily unavailable. I expect it to be back online within the next couple of hours. September 30, 1985 Excel was launched and I therefore wish Excel a very happy birthday and many healthy years to come! Debra Dalgleish over at the contextures blog has gathered a nice set of stories on how people first “met” Excel. To celebrate this great event, I’m offering a 30 percent discount on my products for 30 days. So have a piece of cake with your coffee today and have one of those “those were the days” moments. 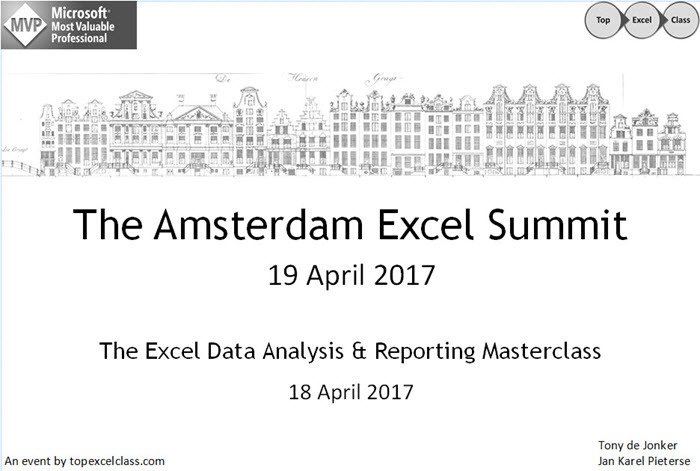 Last year we had a terrific Excel event in Amsterdam in May. This year we’re in for a repeat! So why don’t you book your flights and hotels and join us on April 13th and 14th for an unsurpassed Excel experience! Yesterday, I installed a host of updates, including some of Office. As it happens, I tried to add an ActiveX control to a worksheet and received an error. 2. Excel did not clean up after itself properly and left some temporary files behind. – Remove all files found. Hope this helps other people who might be suffering from the same problem.